The second song of the Hamilton musical is “Aaron Burr, Sir. ” This song introduces us to Hamilton’s friends, as Hamilton meets them. It must be said at the outset that the timing of events in this song, and the locations, are not historically accurate. This puts much of the true historical facts out of context. The song begins, “1776. New York City.” However, many of the subsequent events do not happen during that year, or in New York City. An early example is when Hamilton raps to Burr, “I heard your name at Princeton. 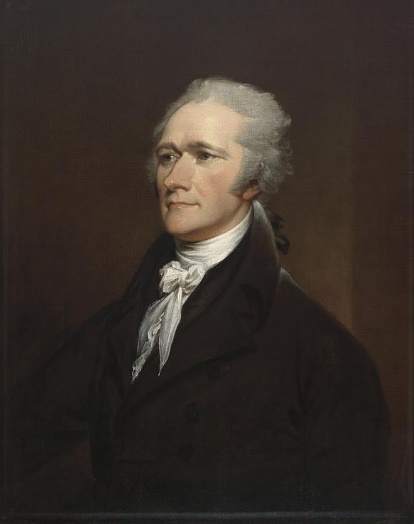 I was seeking an accelerated course of study….” Hamilton did seek an accelerated course of study at Princeton. However, Hamilton entered King’s College (now Columbia University) in New York City in 1773 or 1774. By 1776, when this song is supposed to take place, Hamilton was already in the army, and King’s College was being used as a military hospital. Taking a step back to Princeton, Hamilton approached John Witherspoon, the President of Princeton (then known as the College of New Jersey), to request that he complete his course of study “with as much rapidity as his exertions could enable him to do.” Though Witherspoon was impressed with Hamilton, the request was rejected. Hamilton then tells Burr, “I got sort of out of sorts with a buddy of yours. I may have punched him,” but he doesn’t recall who the man was. Burr responds, “You punched the bursar.” Nothing of the sort happened, but ‘bursar’ rhymes nicely with Burr, sir, and the action fits the storyline of Hamilton as a hothead. Leaving thoughts of the Revolution behind, Hamilton inquires of Burr, “How’d you graduate so fast?” Burr responds, “It was my parents’ dying wish before they passed.” This is most likely not true. Aaron Burr, Sr. died on September 24, 1757, and Burr’s mother, Esther Edwards, died on April 7, 1758. Unlike Hamilton, though, Burr had come from a distinguished background. His father was a reverend, as well as the President of Princeton. His mother was the daughter of Jonathan Edwards, a famed preacher (and briefly President of Princeton after the death of Burr, Sr.) Despite being an orphan, Burr was well-taken care of by his extended family. His parents probably wouldn’t have made it their dying wish that Burr quickly graduate – he was a year old when his father died, and two when his mother passed. Although we can say that they probably would have done all in their power to see that Burr would have graduated from college, had they lived. Soon after Burr’s line above, Miranda has Hamilton exclaiming, “God, I wish there was a war! Then we could prove that we’re worth more Than anyone bargained for.” Hamilton did write, “I wish there was a war,” but this was his closing line in a letter to his friend Edward Stevens in 1769, when Stevens was attending King’s College and Hamilton was still on the island of St. Croix, an orphan unaware that he’d ever travel to the mainland. Also, (and anyway,) because Miranda takes things out of context, Hamilton doesn’t even have to wish for a war in 1776, because the war had already begun. The cool-headed Burr then asks Hamilton if he can buy him drink, and he offers Hamilton some advice – “Talk less…smile more.” While they are drinking, we meet Hamilton’s core group of friends in the musical – John Laurens, the Marquis de Lafayette, and Hercules Mulligan. Miranda again changes the timeline of events here. Hamilton didn’t meet the first two men until 1777. The earliest he meets Laurens is the spring of 1777. Laurens received a letter from General George Washington dated August 5, 1777 asking him to “do me the honour to become a member of my Family.” The General Orders of September 6th made the appointment of Laurens as an “Extra-Aid-du Camp to the Commander in Chief” official. It was probably during this time that Hamilton and Laurens first met. Lafayette didn’t even arrive in North America until June 13, 1777 when he landed in South Carolina. He marched north, arriving in Philadelphia (to meet with the Congress there) on July 27th. Initially rebuffed by Congress, Lafayette requested to first serve in the army at his own expense as a volunteer. He was appointed a major general by Congressional resolution on July 31, 1777. Hamilton probably met him around this time. As for Mulligan, Hamilton already knew him before 1776. In fact, Mulligan was Hamilton’s first friend when he arrived in New York. It’s also possible that Hamilton may have boarded with Mulligan for a short time as well. So there is also a historical inaccuracy at the end of the song when the three men ask, “Who are you?…Who is this kid? What’s he gonna do?” Hamilton still hadn’t met Laurens and Lafayette, and Mulligan had known him since he arrived in New York. “Aaron Burr, Sir” transitions directly into the third song of the musical – “My Shot.” This song fleshes out Hamilton and his friends, and establishes that all, except Burr, are ready to fight in the war. There are a number of instances where Miranda ignores the historical timeline again. Examples include Hamilton’s rap, “I’m ‘a get a scholarship to King’s College,” since by this time he was already out of the school, which was temporarily closed; and Mulligan’s rap, “Yo, I’m a tailor’s apprentice,” as he already had a tailor shop in New York City since at least 1768. There are at least two historically connected lines of this song. Hamilton raps, “Britain keeps shittin’ on us endlessly. Essentially, they tax us relentlessly.” Although historians may discuss the causes of the war (for example, was it really fought just due to taxation without representation? ), the British did begin taxing the colonies after the end of the French and Indian war in 1763, which some in the colonies viewed as overbearing and despotic. Beginning with the Currency Act in 1764 and the Sugar Act of the same year, the British continued levying new taxes on the colonies until a breaking point was reached. So while the colonists successfully fought against the Stamp Act of 1765 and the Townshend Acts of 1767 (Parliament repealed both), their protests of the 1773 Tea Act, culminating in the Boston Tea Party, led to a crackdown by the British, which eventually led to the war. I wish, my Dear Laurens, it m⟨ight⟩ be in my power, by action rather than words, ⟨to⟩ convince you that I love you. I shall only tell you that ’till you bade us Adieu, I hardly knew the value you had taught my heart to set upon you. Indeed, my friend, it was not well done….You sh⟨ould⟩ not have taken advantage of my sensibility to ste⟨al⟩ into my affections without my consent. But as you have done it and as we are generally indulgent to those we love, I shall not scruple to pardon the fraud you have committed, on condition that for my sake, if not for your own, you will always continue to merit the partiality, which you have so artfully instilled into ⟨me⟩. Of course, the times were different then, so who really knows what that means? The drinking scene among friends ends in the 4th song of the musical – “The Story of Tonight,” which needs no historical discussion. Next up in the facts behind the music will be “The Schuyler Sisters,” the fifth song of the musical. Chernow, Ron. Alexander Hamilton. New York: The Penguin Press, 2004. Page 72. Ibid, 48, 47. The rejection is why Hamilton chose King’s College. A reason why he may have been rejected, according to Chernow, is that Witherspoon and the trustees “may have been deterred by the recent experience of a young Virginia scholar who had entered as a sophomore in 1769 and worked himself into a state of nervous exhaustion by completing his bachelor’s degree in two years instead of three.” That scholar was future President of the United States, James Madison. Hamilton served as an aide to Washington from March 1, 1777 until April of 1781. Unger, Harlow Giles. Lafayette. Hoboken: Wiley & Sons, 2002. Page 37. The Currency Act of 1764 forbade the colonies from issuing paper currency. The Sugar Act of the same year actually halved the previous tax on molasses, but the colonists hadn’t been paying that anyway. The Stamp Act of 1765 required colonists to purchase a government-issued stamp for legal documents and other paper goods. The Townshend Acts of 1767 were a series of laws passed to raise revenue to pay the salaries of some colonial governors and judges. Items that weren’t made in the colonies, such as lead, paint, glass, and tea, were taxed. The Tea Act allowed the British East India Co. to operate tax-free, while the colonies still paid a tax on tea.